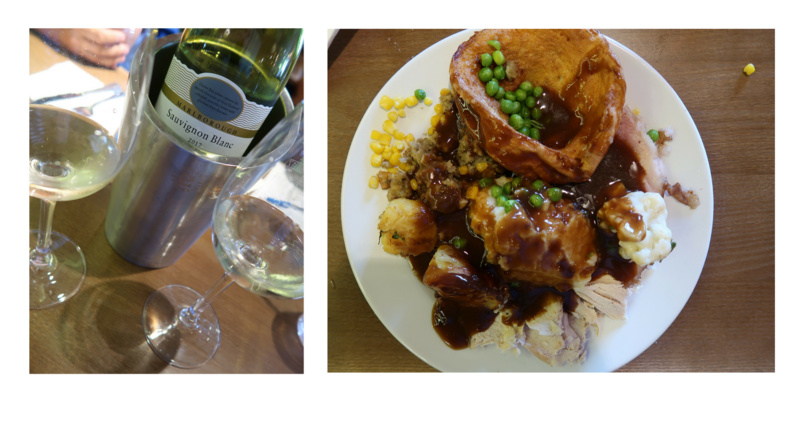 Last weekend we were kindly invited to go and eat at the newly refurbished Toby Carvery Salters Wharf in St Annes. It had been a while since we had been there last so it was lovely to go and sample the food again. As you will know by now I am not one for cooking so we regularly go to carvery restaurants on a Sunday for a family meal. It’s nice to all sit down together and it encourages the kids to not only eat the same meal as we do but gets them to try the vegetables on offer. What I like about Toby Carvery is the waitress service, our friendly, bubbly waitress was over to us within a couple of minutes for our drinks order and to go through the menu . We were, of course, going to be sampling the carvery but she also suggested we try some of the Toby Tasters as a shared starter. These include things like Creamy Mushrooms, Lamb Koftas, Mini Pigs in Blankets Pork Riblets and several other very moorish mini dishes. We choose a selection of the dishes and ordered a lovely bottle of Sauvignon Blanc to accompany our meal. All the dishes are cooked to order so they arrive one by one but this was actually great as the table never felt over crowdwd. My favourite was the creamy mushrooms, ordered with the garlic bread to mop up the sauce. We ordered 6 dishes and truthfully this was far too much but the dishes wouldn’t have been out-of-place in an expensive tapas restaurant. Onto the main course, the carvery !! As I have mentioned before we are no strangers to carvery restaurants, we normally order Harry a children’s carvery and then sheepishly ask for a bowl for Charley and then transfer some of my lunch into her bowl and hope no one gives us the evil eye. I was very pleasantly relieved to see that at Toby Carvery under 3’s are given their own plate free of charge, no funny looks, no feeling like you look like a cheapskate. In fact, this was one of the first things the waitress pointed out to us on the menu so we didn’t waste money on buying an extra meal for Charley. The even provide child size cutlery for little ones to make life even easier. So, what was the carvery like? In one word delicious. There was a selection of 3-4 different types of meat, a huge area with every vegetable going and 4 types of gravy ( they know me well). I only occasionally eat red meat so I stuck to the gammon & turkey but Lee said the roast beef was beautiful and really juicy. The real test was that both kids cleared their plates and Harry then asked for more, which I provided from the large mount of food on my plate. I feel I need to also give a shout out to the Yorkshire Puddings as these were perfection, light, fluffy and crisp. 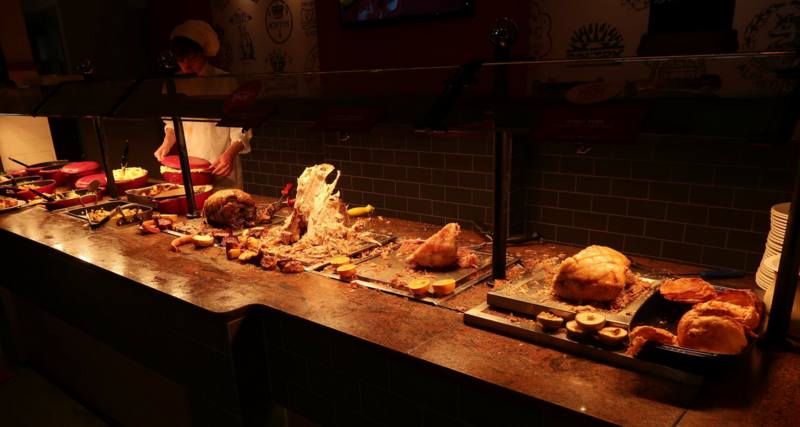 All in all the food was well above the standard we have at other carvery restaurants and the little extras like the waitress service, free meal for under 3’s and the great selection of carvery on offer definitely gives Toby Carvery the upper hand. 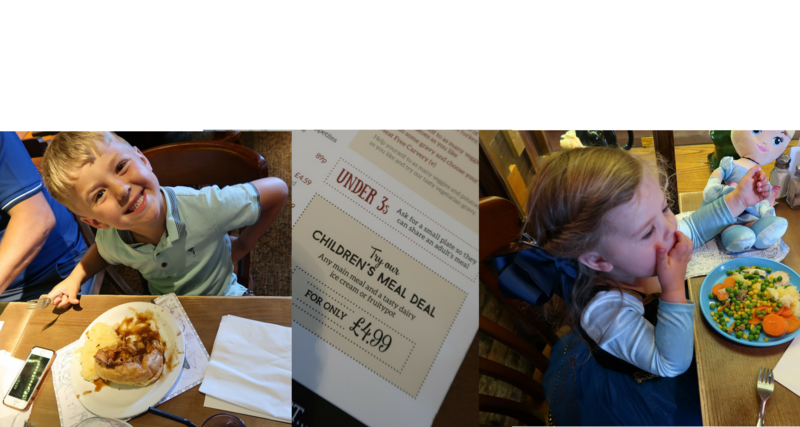 Prices are very reasonable too , the whole meal including starters, drinks, carvery and pudding for the kids came to £50.81. Toby Carvery kindly paid the bill that day but I think £50 for a meal out as a family of 4 is really good, especially when you leave with very full, satisfied tummy’s.The Toby Carvery Salters Wharf is generally busy ( especially on a Sunday ) because of its location so I would book a table if you are thinking of visiting. You can, of course, go without a reservation but you may need to wait 5-10 minutes for an available table. We booked for 2 p.m and were seated straight away. One thing I do want to mention as I feel this add’s to the location of the Toby Carvery Salters Wharf is the kid’s fairground rides just across from the pub. There are only about 4 rides to choose from but it’s a really lovely addition to your family day out to watch the kids on the rides after your lunch. All in all, we had a great afternoon having lunch at the Toby Carvery Salters Wharf and having a stroll around St Annes in the sunshine. I would 100% recommend the restaurant, location and staff to any family looking for a relaxed meal any day of the week. Once again many thanks to Toby Carvery for inviting us for dinner and to see their refurb. We will definitely be back soon for more scrummy food.